Yesterday, the Charlie Rose Show repeated interviews with comics Billy Eichner, Amy Pohler, Matt Besser, Ian Roberts, Matt Walsh, and Seth Meyers. A couple of comments jumped out. So what does that mean for popular culture? Does this mark the beginning of the decline of TV as a mass medium? Is TV, at least comedy on TV, now the artist’s playground, a place where artists can satisfy their own creative agenda? So, yes, apparently we are moving to the Samantha Bee extreme. Comedy producers and consumers are less different. They are growing closer. What a change this is! Comedians were once aliens who infiltrated the human community by manifesting on a standup stage, there to outrage and delight the sensibilities of people who really had no idea what comedy was or where it came from. Not now. Now more and more comedic producers and consumers make up one community. This changes the comedian. She was once a tortured soul, torn between the popular success that came from “safe” comedy and the professional esteem that could only come from “daring” comedy. To use that airspace metaphor again (hold your applause to the end of the essay, please) comedy producers and consumers occupy the same airspace. The comics can just do better stunts. It also changes the audience. They are no longer yokels at a country fair marveling at the ingenuity of these city slickers. (“Dang, how’d he do that!”) They are more likely to scrutinize the architecture of the joke, wondering if Samantha Bee “didn’t maybe put a little too much stress on the last word. I feel.” and then taking (or as Henry Jenkins would say, “poaching”) the joke for their own personal purposes, to make themselves funnier Saturday night at the bar. But it’s not all great news. As two comedic worlds close, two cultural worlds tear apart. As comedy producers and consumers get ever chummier, they take their leave of a large group of fellow Americans. I say, “fellow,” but of course that’s the point. As comedy gets better and pulls away, these Americans are less “fellow.” There are now millions of Americans who couldn’t find the funny in an Upright Citizens Brigade’s routine if their lives depended on it. They can’t actually see the point of it. And there are few things quite as alienating as this. You look a fool. You feel a fool. There are two choices when this happens. You can accuse yourself of being witless and wanting. Or you can attack the person who has threatened you with this judgement, and call them an elite bent on taking your culture away from you. The only way to escape the “fool” judgement is to turn it on someone else. And that’s where politicians like Donald Trump come in. And not just Trump, but an entire industry of pundits, experts, talk show hosts, religious leaders and other politicians have seized upon the “culture wars” as an opportunity to fan the flames of unrest, to mobilize dissent, to coax dollars out of pockets. That’s where we are. Driven by technological innovations and cultural ones, there is now a dynamic driving groups of Americans apart, destroying shared assumptions, and putting at risk the hope that an always heterogeneous America can remain, in the words of Alan Wolfe, one nation after all. This is not an accusation. There’s no obvious enemy. And there’s no obvious answer. No party, ideology, or interest can put Humpty Dumpty back together again. We may self correct. We may not. But chances are slim that this cultural divide will make no difference, not as long as certain interests keep hammering away at it. But it is a confession. I wrote a book in the late 1980s called Plenitude in which I argued that the coming cultural diversity would be a good thing and that we would survive it without descending into a tower of babel or a world of conflicting assumptions. And now it’s beginning to look like I was wrong. You can hear something tearing. This entry was posted in Uncategorized and tagged Alan Wolfe, Amazon, American culture, Amy Pohler, Apollo Theater, Billy Eichner, Charlie Rose Show, Comedy Central, culture, Donald Trump, Full Frontal, Funny or Die, Henry Jenkins, Hulu, Ian Roberts, Matt Besser, Matt Walsh, Netflix, Samantha Bee, Seeso, Seth Meyers, TV, Upright Citizens Brigade on August 24, 2016 by Grant. Why has Donald Trump survived our discovery of his flaws and deficiencies? Normally, a new candidate has his or her moment in the sun, until we discover who they really are. Then they’re done. But this doesn’t ever happen in Trump’s case, however damning the revelations. The answer, I think, is that his supporters don’t want a president. They want a fireship. Fireships were instruments of destruction when the world was ruled by wooden ships. 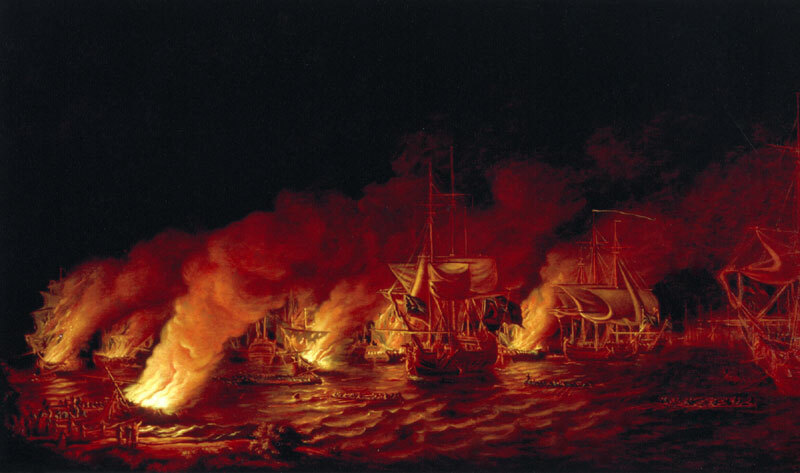 The idea was to pack a ship with flammables, set it ablaze, and send it in the direction of enemy ships in the hope that it would set these enemy ships ablaze. Fireships helped defeat the Spanish armada gathered in the English Channel. Donald Trump promises to make a very good fireship. He lacks the subtlety, intelligence, breadth, and leadership we look for in a candidate. And that’s precisely what makes him such an effective instrument of political disruption. Trumpians don’t want a candidate. They want an agent of chaos. They don’t want to reform Washington. They want to burn it down. This entry was posted in Uncategorized and tagged American politics, Donald Trump, fireships, politics, Trumpians, Washington on September 8, 2015 by Grant. Donald Trump defies the Dorian Gray effect. Why? I found this wonderful image at the train station in my hometown in Connecticut. 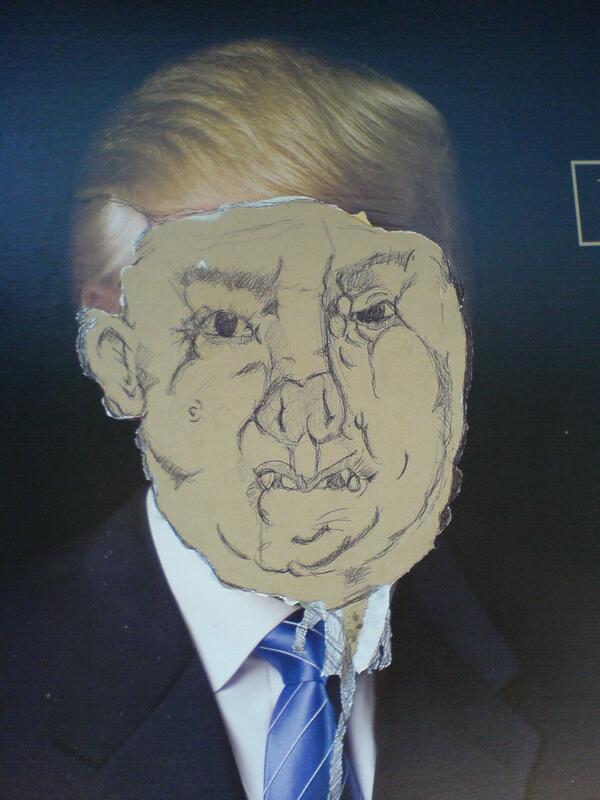 Scratched into an ad on the platform, someone left us a “Dorian Gray” treatment of Donald Trump. Behold the man behind the mask. But that’s the thing about Trump. No one seems to care about his deficiencies or his flaws. This departs from the normal practice of American politics. Normally, it goes like this. An outsider appears in American politics. He or she expresses some deeply felt issue. There’s a brief period of enthusiasm. Then the reporters go to work. Debates happen. Interviews are given. And eventually we get a Dorian Gray revelation of the real man or woman. But it’s not happening this time. Why isn’t happening this time? This entry was posted in Uncategorized and tagged American politics, candidates, debates, Donald Trump, Dorian Gray, Dorian Gray effect, elections, journalism, politicians, politics on September 7, 2015 by Grant. This is a part of a map of London drawn by Fuller (aka Gareth Wood). Wood says that he created a map to show his relationship with the city over several years. Wood’s map of London ends up being a personal document. Of course personal is the last thing that maps are supposed to be. They are supposed to come from official sources and authoritative parties. In an almost magical act of abstraction, they remove everything that has anything to do with anyone. There are millions of people in London interacting with the city in many millions of moments. Mapmaking is meant to make all that disappear. We give you London, all place, no time, all place, no people, all place, no particulars. At all. But more and more we like a world that vibrates with particularities. Public knowledge seems a little thin. Authoritative versions of the world seem a little unforthcoming if not positively stingy. Surely, we think, the world, and especially London, is more interesting than this. This shift in expectation runs through us with big consequences. Political figures must learn from it. Romney seemed very “official map.” Obama seemed somehow more particular. (Though he never did get all that personal.) Hillary is very official map. It’s as if so much of what makes her personal plays to her disadvantage that she wants to get abstract and stay that way. Every politician needs to solve this problem. How to show the real person, the authentic individual, even when everything in them screams to keep the image airbrushed. In his strange, deeply stupid manner, Trump has addressed this problem. Things are easier in the world of the brand. Every brand has been struggling to make itself less official and more particular for some time. This means letting in the consumer and the world in ways that were once unforgivable. American brands used to be very abstract indeed. But they are (marginally) less alarmed about making the transition away from abstraction. Out of the USP into life. I always thought Subaru has done a nice job of this. It’s a good exercise for a politician or a brand. If your present self is a formal map of who you are, what would Gareth Wood’s version look like? Creatives, planners, brand managers, campaign managers, please let me know if you try this and it works. For more on Wood and his map, see the excellent coverage by Greg Miller here. This entry was posted in Uncategorized and tagged advertising, anthropology, branding, brands, Donald Trump, Gareth Wood, Greg Miller, Hillary Clinton, London., map, mapping, politics, private meaning, public knowledge, Subaru, Wired on September 2, 2015 by Grant. I live in a little Connecticut town called Rowayton. We were briefly the Oyster capital of the world. We also played midwife to the first business computer. But nothing much has happened in the last 50 years. We have a talent in our midst. And that talent is turning our train station into an art gallery. Here’s what I found a couple of days ago while waiting for my train to NYC. 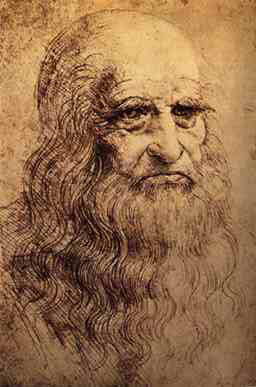 It’s corny to say so, but it made me think of this Da Vinci self portrait. I don’t know if these photos tell the story, but this image has been placed on the platform by a process of dripping / pouring that deprives the artist of absolute control. Its a technique that forces a loose hand working in a single session. Virtuosity gives vivacity. The face that comes up out of concrete (of all things). A knowing, unforgiving, bird-of-prey gaze. 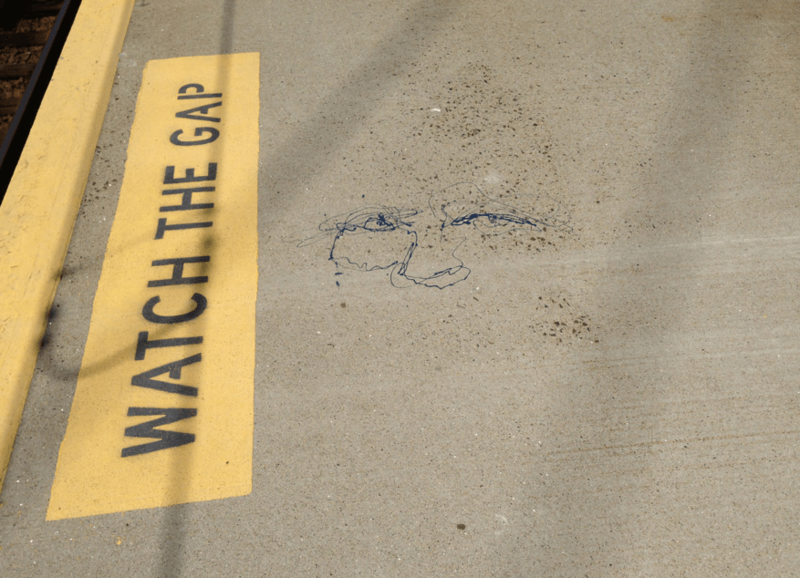 And it commandeers a handy thought bubble: “mind the gap.” What, you mean the artistic life of little Rowayton? Consider it minded! Occupied and then some. Several months ago, when the dreadful Donald Trump was everywhere on screen and in print. This image appeared on an ad in the station. The artist removed Trump’s photographed face and inserted a Dorian Gray revelation of the man within. Porcine Donald. And what a pig he is. Someone with artistic detective skills might be able to determine whether Mind the Gap comes from the same hand as Dorian Donald. And, as you can guess, I am really hoping it does. And not just because it would be wonderful to think that someone has turned our train station into an art gallery. It’s all very Culturematic so naturally I’m thrilled. But, look, I’d be thrilled in any case. I spend some part of the spring talking to Peter Spear and Rainer Judd about a project that would encourage the eruption of art in small town America and here someone drops this under my very nose. It is a Culturematic because it converts a train station into an art gallery. Culturematics are almost always opportunistic and cunning in this way. But it also turns our train system, Metro North, into a delivery system for art lovers everywhere. As long as someone can find the line, they can count on effortless and precise delivery! Let me know you’re coming and I will put on my docent costume and meet you there. Gallery station memberships are reasonable so don’t forget your credit card! 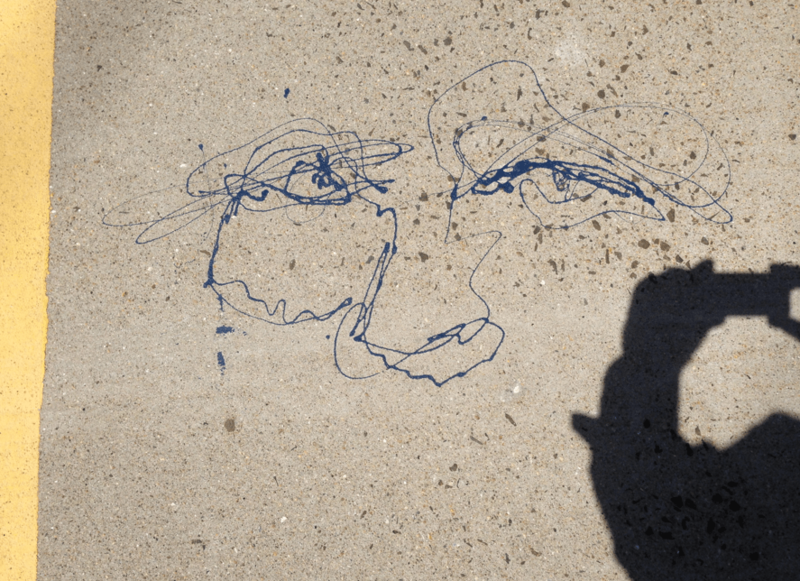 This entry was posted in Uncategorized and tagged art, Brien McMahon High School, culturematic, Donald Trump, Peter Spear, Rainer Judd, Rowayton, Rowayton Station, street art on August 6, 2013 by Grant.